A virtual guide to Somalia, officially the Federal Republic of Somalia, the easternmost country on mainland Africa is situated on the peninsula known as the Horn of Africa. Somalia is bordering the Gulf of Aden in north, Djibouti in north west, Ethiopia in west, and Kenya in south west, in east it borders the Indian Ocean, and it shares maritime borders with Yemen. The country covers an area of 637,657 km², compared it is more than twice the size of Poland, or slightly smaller than Texas. Somalia has a population of 12.3 million people, capital and largest city is Mogadishu, spoken languages are Somali and Arabic (both official). The Transitional Federal Government (TFG) has been deeply divided since just after its creation and until late December 2006 controlled only the town of Baidoa. In June 2006, a loose coalition of clerics, business leaders, and Islamic court militias known as the Supreme Council of Islamic Courts (SCIC) defeated powerful Mogadishu warlords and took control of the capital. The Courts continued to expand, spreading their influence throughout much of southern Somalia and threatening to overthrow the TFG in Baidoa. Ethiopian and TFG forces concerned over suspected links between some SCIC factions and al-Qaida in late December 2006 drove the SCIC from power, but the joint forces continue to fight remnants of SCIC militia in the southwestern corner of Somalia near the Kenyan border. The TFG, backed by Ethiopian forces, in late December 2006 moved into Mogadishu, but continues to struggle to exert control over the capital and to prevent the reemergence of warlord rule that typified Mogadishu before the rise of the SCIC. In January 2009, following the creation of a TFG-ARS unity government, Ethiopian military forces, which had entered Somalia in December 2006 to support the TFG in the face of advances by the opposition Islamic Courts Union (ICU), withdrew from the country. The TFP was doubled in size to 550 seats with the addition of 200 ARS and 75 civil society members of parliament. The expanded parliament elected Sheikh SHARIF Sheikh Ahmed, the former ICU and ARS chairman as president in January 2009. Since 2012, when a new internationally-backed government was installed, Somalia has been moving slowly towards stability, but its authorities still face challenges from Al-Qaeda-aligned Al-Shabab insurgents. Despite being ousted from most of its key strongholds in south and central Somalia, al-Shabab continues to launch deadly guerrilla attacks against the Somali government and African Union forces across large parts of the horn of Africa nation. Population: (2012) 9.7 million, of which an estimated 2 million live in Somaliland. Somalia has been without a central government since President Siad Barre was overthrown in 1991, and much of the territory has been subject to serious civil strife. In August 2012 Somalia's first formal parliament in more than 20 years is sworn in. In January 2013 the US recognizes Somalia's government. In May 2015 US Secretary of State John Kerry pays brief visit to Mogadishu. Somalia Federal Republic - Office of the President (in Somali and partly in English). Website of Somalia's representation to the UN. Somaliland is a de facto independent republic located on the northern part of the Horn of Africa within the internationally recognized borders of Somalia. Puntland is a region in northeastern Somalia, bordering Somaliland in west, centered on Somalia's Garowe (Nugaal region). Puntland's leaders declared in 1998 Puntland to be an autonomous state. 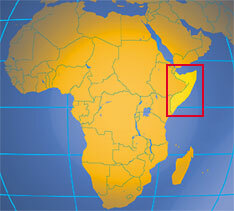 Searchable map and satellite view of Somalia. Searchable map and satellite view of Somalia's capital city. News in Somali and partly in English. Somalia news in Somali and partly in English. with News in English and Somali. Voice of America Africa Somalia news. Gallery site of the Somali born painter Mohamed Buwe Osman. Domestic scheduled and charter flights. Portal site of the Somali Maay Population. US based site for Somali Bantu Refugees. First institution of higher learning in Somalia after years of war. Somaliland’s youngest accredited higher education institution. Non-governmental institution of higher education. SOTAS is an umbrella association serving to facilitate networking and collaborative and cooperative work between members across the education and training sector, and with other education and training, private, nonprofit and governmental partners. An independent university established in 2004 in Burao, Somaliland. Established for Somalia's destroyed environment and water scarcity problems. Wikipedia entry about the History of Somalia.